RPS-500 Analog Ranging Card - Deeter Electronics Ltd. RPS-500 Analog Ranging Card - Deeter Electronics Ltd. 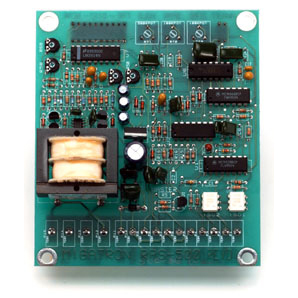 The RPS-500 ranging board was designed to give analog voltage and current outputs proportional to distance and can be used with the RPS-100, RPS-300, RPS-325 or RPS-326. It is a fast, accurate means of converting analog pulse width generated by the ultrasonic sensor into analog voltage and current. Ranges available are 2″ to14″, 5″ to 36″, 5″ to 72″, 10″ to 240″. The isolated form C relay furnishes N.O. and N.C. outputs, and with the addition of the RPS-500 card various analog outputs are supplied. The RPS-326 sensor, which operates at a frequency of 37kHz, has a narrow sensing beam. Sensing ranges available for the RPS-326 include 24″ to 72″, and 24″ to 240″. Mounting flanges, LED indicator, ranging potentiometer and 30ft. transducer cable are included. Optional cable lengths are available. The RPS-500 analog card comes with a zero and span control. These two potentiometers allow the analog signal to be adjusted over a desired range. The adjustment ratio is 5:1. This means that the RPS-500-14 (range 2″ to 14″) can be adjusted to give an analog output over a range as small as 2.4″ or as large as 12″. Example: If you desired a 4mA signal at 4″ and a 20mA signal at 14″ you would adjust the analog card as follows. Place a target at 4″ and adjust the zero control until your current meter reads 4mA. Move the target to 14″ and adjust the span control until you reach 20mA. With no more than two adjustments of each potentiometer the desired range will be achieved. If the analog card is in the inverted state, voltage and current decreasing with distance, the zero pot will adjust the 20mA point and the span pot will adjust the 4mA point. Always adjust the close point first. Both the current and voltage outputs of the analog RPS-500 card can be inverted. In the non-inverted state (switch 1 ON switch 2 ON) the voltage and current increase with distance. In the inverted state ( switch 1 OFF switch 2 OFF) the voltage and current decrease with distance. Note: The inverting switches should be set in the desired positions before beginning adjustments with the zero and span controls. After each return echo the output voltage and current are updated. If no echo is received the previous readings are maintained or held. The time these readings are maintained will depend on the setting of the hold potentiometer, cw (up to 5 seconds). After this time has elapsed, the outputs will go to there maximum readings, indicating that there is no return echo. The advantage of this control is that it allows an echo or echos to be missed for a time without changing the output readings. This has proven to be advantageous in level control where the surface may be agitated. This 10 segment LED display will tell when a return echo is in the range of the sensor. For example, when the RPS-500 card is used with the RPS-300-14 and the target is 4 inches away just 1 or 2 LEDs will be on. When the target moves to 9 inches about 1/2 of the display will be on, and when the target is 14″ away all the LEDs will be on. When the enable line is held high (high = 3 to 30V) the sensors will not transmit and the hold circuit will time out, causing the outputs to go to a maximum reading. A short time (Approximately 4.2mS) after the enable line is pulled low (low = 0 to 1V) the sensors will transmit. When a return echo is received the outputs will be updapted. Output 4 – 20mA: Current sourcing, load 0 to 500 ohms. Reference to “GND OUT” terminal. Output 0 – 10VDC: Load Equal to or Greater than 500 ohms. Reference to “GND OUT” terminal. Up Date Time: 10mS 14″ card, 20ms 36″ card, 40mS 72″ card, 150mS 240″ card. SPAN Control: Adjustable 5 : 1 ratio. Switches: 1 ON, 2 ON increase voltage and current with distance. 1 OFF, 2 OFF decrease voltage and current with distance. Output Isolation: 2500V for outputs 0-10 VDC, 4-20MA when powered by 120 VAC. must be full cw for maximum analog ranges. to the RPS-100, 300, 325, or 326 Ultrasonic Sensor. which is needed to prevent cross talk. The following wire connections should be made.